For catechesis in the Catholic Church, see Catholic catechesis. For the 2000 video game, see Catechumen (video game). In the Catholic Church, catechist is a term used of anyone engaged in religious formation and education, from the bishop to lay ecclesial ministers and clergy to volunteers at the local level. The primary catechists for children are their parents or communities. Protestant churches typically have Sunday School classes for educating children in religion, as well as adult classes for continuing education. In ecclesiology, a catechumen (/ˌkætɪˈkjuːmən, -mɛn/; via Latin catechumenus from Greek κατηχούμενος katēkhoumenos, "one being instructed", from κατά kata, "down" and ἦχος ēkhos, "sound") is a person receiving instruction from a catechist in the principles of the Christian religion with a view to baptism. The title and practice is most often used by Anglican, Lutheran, Methodist, Orthodox, Reformed/Presbyterian, and Roman Catholic Christians. Ecumenical organisations such as the North American Association for the Catechumenate are helping to, across several denominations, "shape ministries with adult seekers involving an extended time of faith formation and a meaningful experience of adult baptism at Easter." The word catechumen comes from the passive form of the Greek word κατηχέω (katēcheō), which is used seven times in the New Testament. In the passive, it means "to be instructed, informed." As many as are persuaded and believe that what we teach and say is true, and undertake to be able to live accordingly, are instructed to pray and to entreat God with fasting, for the remission of their sins that are past, we praying and fasting with them. Then they are brought by us where there is water, and are regenerated in the same manner in which we were ourselves regenerated. The "persuasion" would be carried out by the preaching of an evangelist; but since belief must precede baptism, the person concerned should be prepared spiritually to receive the indwelling of the Holy Spirit through baptism. That person would receive the sign of the Cross and possibly aspersion with holy water from a minister, indicating their entry to the state of catechumen. In the early church, catechumens were instructed (catechized) in the basic elements of the faith such as the Apostles' Creed, Lord's Prayer, and sacraments in preparation for baptism. Catechumens were limited as to their attendance in formal services. As unbaptized, they could not actively take part in any service, for that was reserved for those baptized. One practice permitted them to remain in the first part of the mass, but even in the earliest centuries dismissed them before the Eucharist. Others had them entering through a side door, or observing from the side, from a gallery, or near the font; while it was not unknown to bar them from all services until baptized. Their desire for baptism was held to be sufficient guarantee of their salvation, if they died before the reception. In event of their martyrdom prior to baptism by water, this was held to be a "baptism by blood" (Baptism of desire), and they were honored as martyrs. In the fourth century, a widespread practice arose of enrolling as a catechumen and deferring baptism for years, often until shortly before death, and when so ill that the normal practice of immersion was impossible, so that aspersion or affusion—the baptism of the sick—was necessary. Constantine was the most prominent of these catechumens. See also Deathbed conversion. During the fourth and fifth centuries, baptism had become a several-week-long rite leading up to the baptism on Easter. During this time, catechumens attended several meetings of intensive catechetical preaching, often by the bishop himself, and often accompanied by special prayers, exorcisms, and other rites. Catechumens recited the Apostles' Creed on Holy Saturday to show that one had completed catechetical instruction. By the sixth century, most of those presented for baptism were infants, and pre-baptismal catechesis was abandoned. The decline of preaching and education in general following the barbarian invasions also affected the decline of catechesis. Later, instructors (catechists) would teach Christians who had been baptized as children, to prepare for practicing the religion as thinking persons, both older children and adults. The term, catechism, used for a manual for this instruction, appeared in the Late Middle Ages. During this time the instruction was also expanded to include memorization of the Lord's Prayer and Apostles' Creed. Some clergy probably provided expositions of this material in addition to the Ten Commandments. The main function of catechesis during this period was preparation for confession by enabling the Christian to identify their sins. Cyril of Jerusalem wrote a series of sermons aimed at catechumens, outlining via passages of scripture the main points of the faith, yet dividing between those merely interested and those intending baptism then continuing with certain sermons aimed at those who had been baptized. St. Augustine was among those enrolled as a catechumen as an infant, and did not receive baptism until he was in his thirties. He, and other Fathers, fulminated against the practice. Jean Gerson's L'ABC des simples gens was an important catechetical work published at the advent of the printing press. 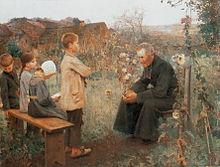 Along with Gerson's other catechetical works, it addressed the unique problems of teaching the faith to children. Sixteenth-century Christian humanists considered the reform of catechesis to be a high priority.Bishop of Basel Christoph von Utenheim, in one of the most successful efforts to revive catechesis, worked to have regular catechetical preaching instituted throughout his diocese. Johann Geiler von Kaisersberg was another popular preacher who followed the tradition of Gerson by preaching on the basics of the faith. In no case is a catechumen absolutely bound to be baptized, preserving the principle that the recipient of a sacrament must not be forced against his will : the person concerned must be drawn spiritually to the faith in addition to being intellectually persuaded. The catechumenate for adults, comprising several distinct steps, is to be restored and to be taken into use at the discretion of the local ordinary. By this means the time of the catechumenate, which is intended as a period of suitable instruction, may be sanctified by sacred rites to be celebrated at successive intervals of time. The Neocatechumenal Way and the Light-Life Movement of the Roman Catholic Church take as their inspiration the old catechumenate of early Christianity (the "primitive church") as the basis for their goal of adult faith formation for Roman Catholics. In many Protestant churches, particularly those preferring not to baptise infants, the catechumenate status may be considered the norm amongst the young. This is especially true amongst young Christadelphians, although they never use the specific term catechumenate, more normally referring to those in this state as "being instructed" or "being taken through". "that the Provinces be encouraged to restore the catechumenate, or discipling process, to help enquiries move to Christian faith, using the witness and support of lay people, and liturgically celebrating the stages of growth;"
Jehovah's Witnesses require a catechumenate of adherents prior to baptism by means of a study program led by a baptized minister, using a Watch Tower Society textbook that teaches basic Witness doctrines. Students initially progress to become an "unbaptized publisher" of the faith, preaching while continuing further biblical instruction—akin to a catechumen, although the term is not specifically used. After demonstrating sufficient comprehension and application of Jehovah's Witnesses' interpretations of the Bible, the student qualifies to be baptized as a Jehovah's Witness. from which the working of God on the catechumen is presupposed. Once baptized, the relationship with God is of a different order. Since the schisms between the parts of the Church, conversion between the denominations is also possible. Education in the specific doctrines of the sect is therefore seen as necessary, as well as a thorough grounding in the first principles of the faith. This latter may already have occurred when the convert is mature, and the status of catechumen is then usually not implied. The three cases - baptized as an infant, come to the faith in maturer years, and conversion from one denomination to another - seem outwardly similar. This has led to discussions on their differentiation, notably the International Anglican Liturgical Consultation which, at its meeting in Toronto in 1991, stated that  the catechumenate for those about to be baptized as infants was to be absolved by their parents and sponsors, thus defining the catechumenate as necessary for all, whether directly or by proxy. The status of the "converted" was dealt with at the same time, but in a way that cannot be considered typical of general Christian thinking, when it was declared that rebaptism was not to be thought of; as a consequence the previously baptized cannot become catechumens. The remark in the foregoing section on "stages of growth" is important to understand this confusion, and happily this can also be seen as typical of the thinking outside the Anglican church. While all parts of the Church promote the growth from catechumen to novice to full member of the communion, the Protestant churches align it with the education of the young who are already baptized, whereas the Orthodox and Roman parts of the church keep this separate. Various terms are used to describe this process: "alpha courses", "nursery courses", "starter groups", among others. The main difference between denominations is whether these courses include or exclude those who are baptized, and an overlap with youth ministries and even to an extent with evangelism is observable. For further discussion not directly related to the state of catechumen, see other Wiki articles. The form of education varied, though the earliest recorded methods were lists of questions and answers (Catechism). Sermons were also used (Cyril of Jerusalem). Most catechisms were divided into parts, aiming to follow the spiritual growth of the catechumen. There were certain differences between catechisms for the young baptized and for the unbaptized catechumen. The divergence between Christian practice as regards catechumens (a formalised, gradual approach) and the idea of conversion (a sudden, overwhelming event) as the entry into the Church, is one of appearance rather than substance. It is recorded in the Bible that Paul the Apostle, who started out as a Jewish persecutor of the Church, underwent sudden conversion on the way to Damascus when Jesus Christ appeared to him in a vision. Regarded as the type of sudden conversion, this event was followed by baptism, with, however, a period of study and learning following, lasting a number of years. While there are examples of people being immediately baptised after having declared their faith, it seems that this was the exception rather than the rule (see above). Quoting Shaye J. D. Cohen: From the Maccabees to the Mishnah (1987) "The Sadducees were the aristocratic opponents of the Pharisees. The Essenes were a group of religious and philosophic virtuosi, living a utopian life of the sort that would provoke the admiration of Jews and non-Jews alike. Josephus mentions their three-year catechumenate, their oath of loyalty to the group, their separation from their fellow Jews, their emphasis on purity and ablutions, but he regards them not as a "sect" but as a pietistic elite." See also Proselyte. This article incorporates text from a publication now in the public domain: Chisholm, Hugh, ed. (1911). "Catechumen" . Encyclopædia Britannica (11th ed.). Cambridge University Press. ^ "What is the Catechumenate?" (PDF). Anglican Church of Canada. Retrieved 9 October 2015. ^ "Journeying toward baptism: The catechumenate, an ancient rite of preparation, invigorates modern souls and churches". The Lutheran. Augsburg Fortress. 1999. Archived from the original on 9 January 2016. Retrieved 9 October 2015. ^ Ku, Bonil (2010). A Catechumenate for the Korean Methodist Church. In order to produce a renewed catechumenal structure for Korean Methodism, adult catechumenal processes as well as baptismal theologies and rites are examined and analyzed from three principal sources: the first five centuries of the Christian church, and especially the mystagogical literature of the fourth century; the Roman Catholic Rite of Christian Initiation of Adults developed after the Second Vatican Council; and the United Methodist Church in the United States, both texts officially authorized by the denomination's General Conference and unofficial materials, among them resources for an adult catechumenate in the Come to the Waters series. ^ Stevens, John G.; Waschevski, Michael (16 December 2014). Rhythms of Worship: The Planning and Purpose of Liturgy. Presbyterian Publishing Corp. p. 49. ISBN 9780664260170. Through the North American Association for the Catechumenate, denominations as varied as Episcopalian, Lutheran, Presbyterian, and Mennonite are working together to shape ministries with adult seekers involving an extended time of faith formation and a meaningful experience of adult baptism at Easter. ^ Yamane, David; MacMillen, Sarah; Culver, Kelly (1 January 2006). Real Stories of Christian Initiation. Liturgical Press. p. 136. ISBN 9780814618264. North American Association for the Catechumenate is an ecumenical organization which provides training and support for churches engaged in the process of baptismal conversion and making Christian disciples. ^ Green 1996, p. 17. ^ "Constitution on the Sacred Liturgy Sacrosanctum Concilium". Vatican.va. Archived from the original on 21 February 2008. Retrieved 16 November 2014. ^ "Laying a Foundation for the Right Kind of Ministers", The Watchtower, March 1, 1969, page 139. ^ "Why Be Baptized", The Watchtower, April 1, 2002, pages 13. Manternach, Janaan; Pfeifer, Carl J. (1991). Creative catechist: a comprehensive, illustrated guide for training religion teachers (2 ed.). Twenty-Third Publications. p. 23. ISBN 978-0-89622-490-2. Retrieved 2010-11-06. The life of the community and its diverse individuals now are seen as both the primary curriculum and the primary catechist. Wikisource has the text of the 1911 Encyclopædia Britannica article Catechumen. The Blog That's All About R.C.I.A.